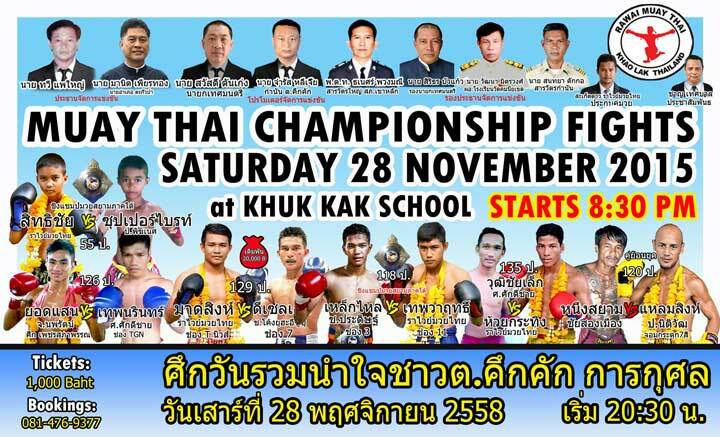 30 Nov Muay Thai fight of the year! Spolier alert: The elbow to the face Knockout is at 07:20. But keep watching to see Lemsing’s signature dance moves as a celebration. Great stuff! Congratulations on an amazing career. สุดยอดนักต่อสู้”แหลมสิงห์”ได้ขึ้นชกครั้งที่500ไปเมื่อวันที่ 28 พ.ย 2558 และได้กลายเป็นการชนะครั้งที่446 โดยเพียงแค่ยกที่3 ด้วยการฟันศอกน๊อคเอ้าท์คู่ต่อสู้!…ว้าว!.. Rawai Muay Thai organised a very special event for everyone in Khao Lak on the 28th November 2015. Fifteen Muay Thai fights in one night! This included some of the best fighters from Rawai Muay Thai’s training camp in Khao Lak and also had several professional championship fights. However,for all the real fans and historians of Muay Thai, the highlight of the evening was Lemsing’s 500th professional fight!